Prepare for a trip deep into the mountains, with this unique adventure game called A Ride Into The Mountains. 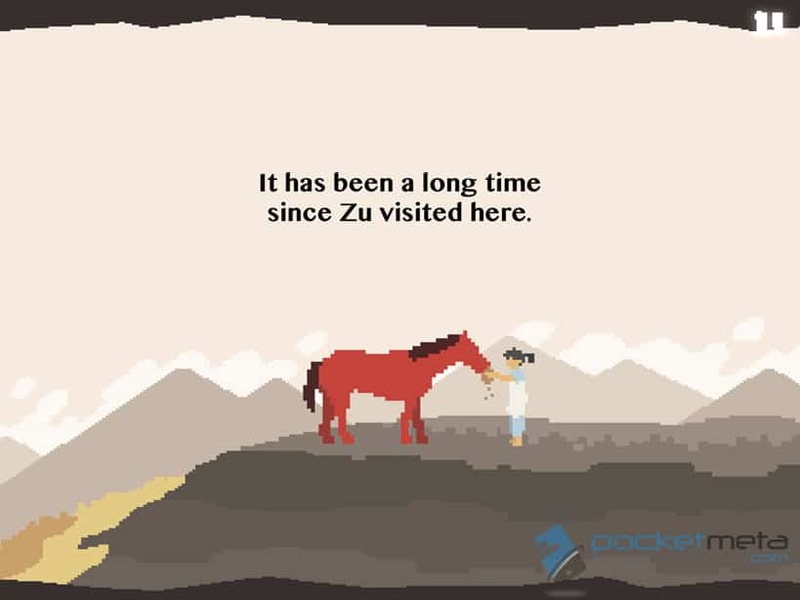 A Ride Into The Mountains is a unique game that covers a story of a young man named Zu and his horse. Zu lives on the hill-side of a mountain where he and generations of his family has protected an ancient and powerful relic. When this mystical relic starts to fly off the handle, Zu packs up his bow, and takes off into the mountains on his horse to investigate the strangely behaving relic. You’ll ride through dangerous valleys and rigid mountain trails, as you fend off strange beings with your bow and arrows. The story in itself is simple, yet elegant and occasionally pulls on the heart strings with its soft music and meaningful text. Growing up in the early days of the video game generation, I’ve always considered myself to have excellent hand eye coordination. A Ride Into The Mountains has stood to challenge me on that, as playing through even the first few stages had me concentrating hard at coordinating between movement and firing arrows off at my enemies. If you’ve ever tried to pat your hand on top of your head while using your other hand to run circles around your chest, you’ll know that some movements between the left and right hand just don’t want to coordinate with each other. This is a similar feeling that I had when I first started playing Ride Into The Mountains, as you use tilt controls to either move your horse up and down, and side to side, while using your other hand to tug back on the bow string, aim, and fire. The concept may sound simple, but until you grab the reins of Zu’s faithful horse, you won’t really understand the challenge. Some of you may be thinking “Bad Controls”, but that couldn’t be further from the truth. 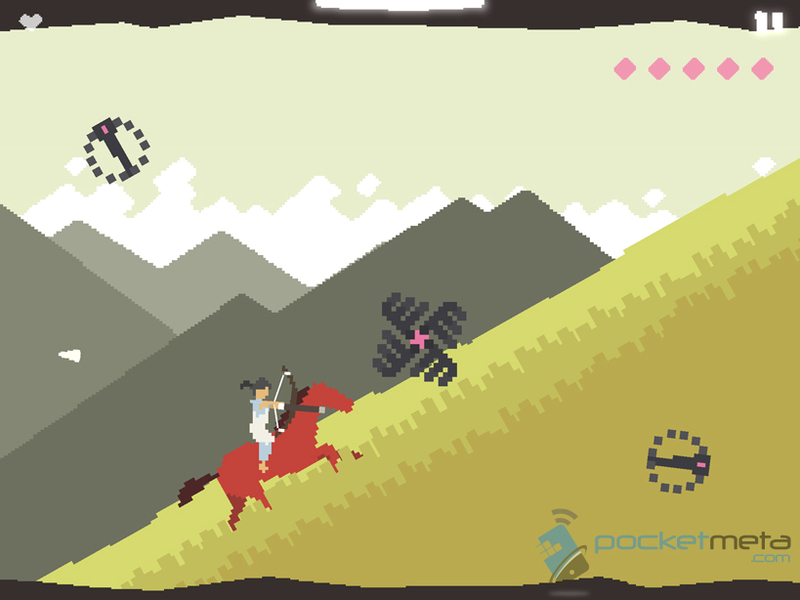 Even though the controls are challenge at first, each stage you complete you’ll become more and more comfortable with Zu and his Horse. You’ll never truly feel completely comfortable your first play through, because each stage provides a new and challenging approach to these unique controls. I first played the game on my iPad, which seems to add to the difficulty. Using the tilt controls in so many different directions while aiming with your other finger on a large screen can feel a bit cumbersome. In fact, you may want to turn off auto-rotate for the screen when playing on a tablet, because I often ran into the issue of the screen flipping over during a crucial boss fight. Which the boss fight at the end of each level, requires a combination of all the techniques needed to get through that level. Each level also offers a slight different approach with controls or camera angles, sometimes you’ll be tilting back and forth from a top down perspective, while others you’ll be running from a side view tilting side to side. When I first started the game I was impressed by it’s simple, yet challenging design, I was even more impressed when I started to see the multitude of mechanics added into the game. A Ride Into The Mountains offers a great visual appeal, with that of the growing popularity of pixel art. If you enjoy the art style in games like Sword & Sworcery, you should definitely be pleased with what A Ride Into The Mountains has to offer. As with most games that take this art direction, the music is also fantastic. The melodies in the game range from scores that have a soft and soothing sound to those that ring with eeriness and dread. It may not be the most complex title with multiple paths and endless items to collect, but for what A Ride Into The Mountains aims for, it no doubt nails the target. You can purchase A Ride Into The Mountains on the Apple App Store or Google’s Play Market for $0.99. Requires iOS 4.3 and later or Android 2.3 and later. Be sure to leave any questions or comments below, if you’ve had the pleasure of playing A Ride Into The Mountains, we’d also love to hear your thoughts on the game. You can also like our Facebook page, follow us on Twitter, and add us to your circles in Google+ to keep yourself up to date on all things mobile.